I am pleased to welcome you to The College of New Jersey community. Your participation in our Summer Reading Program is a first step in your career at the College and should help prepare you for our challenging and engaging academic environment. The College is a values-based institution that seeks to provide a context in which you will learn and grow. As an institution, we value our past and encourage you to do the same; we also honor our responsibilities to the state and nation and we insist that you do so as well. These responsibilities cannot be met by only looking backward; we must also look around and look ahead. I encourage you to take advantage of the opportunities that will present themselves throughout your time on the campus. In the short time you will spend with us you will further develop your passions and will have the chance to develop new ones. Now is the time to discover the impact you can make on the world. Like the institution that you have joined, your experience at The College of New Jersey is contextual. You will learn from others and they from you; you will learn from their pasts and they from yours. As a consequence of this contextual learning, you will come to understand your past better. This greater understanding will result in great changes for you and for the larger community in which you live, changes that continue to position us to thrive in the twenty-first century. As a community dedicated to free inquiry and open exchange, we seek to help nourish the development of our students to become leaders in our complex and diverse world by providing a supportive environment in which to challenge each other and ourselves intellectually. 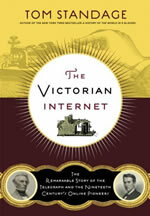 Tom Standage’s The Victorian Internet has been selected as this year’s Summer Reading. The Summer Reading is a part of the College’s annual series of intellectual and cultural programs designed to engage our community in discussion around a selected theme. The theme for this year is “The Pursuit of Innovation.” As part of Welcome Week, you and your peers will have an opportunity to examine Standage’s book in a discussion led by a faculty/staff facilitator on August 29, 2011. Please see the reverse side for Summer Reading instructions. Again, welcome to the community of The College of New Jersey. I hope you will take full advantage of what the College has to offer you, and what you have to offer our community. This academic year the College is sponsoring a series of programs based on the theme “The Pursuit of Innovation.” The theme will be inaugurated at the Summer Reading discussions on August 29 and celebrated at the campus-wide Community Learning Day on October 5. This year’s Summer Reading is Tom Standage’s The Victorian Internet, written in 1989 about the invention of the telegraph and its monumental influence on communications. It was revised in 2007 in order to make more direct reference to the contemporary internet. With the theme of “The Pursuit of Innovation” in mind, please be prepared to share your responses to The Victorian Internet with your fellow students and your faculty/staff facilitator in your Summer Reading discussion group on August 29. Is it reasonable to see the internet not as a new communications medium but rather as a continuation of the telegraph? If so, what are the principal features of the internet that have their origin in the telegraph, or that carry forward similar capabilities? If not, why not? What does your response have to say about what we may regard as unique to our own times? How does it affect your view of history? Think about the pursuit of innovation and how the development of the telegraph reflects it. In addition to the contemporary internet, think about another innovation and examine the process of its creation and its intended and unintended consequences and impact on society. Feel free to relate it to your expected major program or possible career. Apply the same thinking to the contemporary internet and its related devices. Be sure to make direct reference to The Victorian Internet. How does The Victorian Internet illustrate the pursuit of innovation? What are some of the changes and improvements that resulted in the ‘mature’ telegraph? Be sure to use the text to illustrate how innovations are sometimes planned and sometimes the result of happenstance. How was society transformed by it? What do you think was its most significant impact? In what ways is the contemporary internet an outgrowth of or parallel to the telegraph during its heyday? How do visions and motivations of the innovators coincide with and differ from those who use their inventions? Examine how the innovations of the telegraph and the internet have changed such fundamental matters as language, time perception, and definitions of friendship. Consider the extent to which these changes may be in response to intrinsic elements of the invention, such as immediate communication—or merely accidental details, such as a response to the technical need to send as few characters as possible. You may want to compare changes in language use among high school students today with how The Victorian Internet had an impact on language use in the 19th century. Please submit your essay by August 24 into the Dropbox of SOCS under your FSP course number. Please also bring a hard copy of the essay to your discussion session on August 29. To submit your essay, go to socs.tcnj.edu and input your TCNJ email username and password. Once in SOCS, choose your FSP from the list of your courses for the fall 2011 semester. Once in the profile of your FSP course, choose the “Dropbox” tab on the left side of the screen and follow instructions to upload your essay. Please note: We will be using the Walker paperback edition of The Victorian Internet (with the 2007 Afterward). It is available at the College Bookstore, but you are free to purchase it anywhere—ISBN-13: 978-0-8027-1604-0.